http://www.animenewsnetwork.com/interest/2015-10-29/bandai-teases-giant-26-inch-sdf-1-macross-14-inch-vf-1-valkyrie-toys/.94775#gallery_top In its larger 1/60-scale DX Chōgōkin line, Bandai will offer: Macross Plus: YF-19 please dont let this be a joke or a misread! Tamashii website has revealed RD O Gundam. Thanks to noel for the assist in creating the poll! Hello everyone, Time for a short review on the Bandai VF-171 Nightmare Plus kit from Bandai. This is a non-scale mini snap kit. I haven't seen many people talking about this thing here, so I'd like to give my impressions on the mini kit. List price at HLJ is 500¥, I got it for 425¥ when I ordered it. The box size is 8.5cm x 15.1cm x 3.8cm. The model, when build, is 8.5cm in lenght and has a wingspan of 7.5cm. The manual is printed into the box, but easily readible. The plastic casting was in a plastic bag as usual. For the size of the kit, the detail is nice and fine. There aren't much parts in this kits, but that is okay. Some of the parts are really small, which I will show in another picture. The decals are precutted self adhering stickers like in the 1/100 scale Macross Frontier model kits. As you can see the sickers are really small, so handling them might be tricky. Sorry for the bad quality pic, but here you can see that the main body is snapping together nicely, leaving no gap. My experience from other Bandai kits (1/100 VF-25, 1/100 VF-2SS, 1/144 VF-17, VF-11 MAXL, VF-11B/C, VF-19 KAI, Gundam RX-78 and Gundam RX-78-2) is, that there will be some gaps here and there which will require glueing or filling paste. There is a relatively large gap infront of the nose. Using glue can fix this easily. Here is one of the extremely small parts, just to give an example. Done - Build time with taking pictures inbetween is ~15 minutes. I didn't attach the stickers yet as I want to airbrush that thing properly. The calculated scale for this small kit is 1/184. Conclusion: A nice little addition to my Macross Mecha collection. There isn't much love for the VF-171 in form of model kits, so this small kit makes me happy that I can have it in my shelf. If needed this kit could be painted in Macross Frontier colors. As far as I know there wasn't much change on the VF-171 design between Frontier and Delta. The kit isn't having much gaps that need filling. For the size the details are good, better than on the old Macross 7 1/144 kits. If you have sausage fingers like me, you will probably have trouble to handle the small parts, but nothing that tweezers couldn't handle. I hope this will help to get an impression on this little gem. If you have any question regarding this kit, please let me know. Hi everyone. I just wanted to start a proper thread for this. I put up adapters for Gundam stands that can hold up Yamato valks. 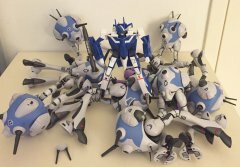 Here's some images that CoreyD posted on http://www.macrossworld.com/mwf/index.php?showtopic=37622'>his thread. Heres' the link for them: http://www.shapeways.com/shops/exodigital'>http://www.shapeways...hops/exodigital And here's the HLJ link to the stands: http://www.hlj.com/scripts/hljlist?Word=gundam+stands&DisplayMode=images&Dis=2&Sort=std&qid=IHYE32P2QUVS4Q&set=1&q=1&MacroType2=displaybse'>http://www.hlj.com/s...ype2=displaybse It's an inexpensive solution for your display needs. Thanks! I've uploaded the adapters that removes the need for the hinge. It makes for a more sturdier stand and can actually hold a 1/48 with Fast Packs. I had to create ones with angles that bank because removing the hinge means less pose-ability There should be enough variety to suit your needs. I've also renamed the product so the number of different ones won't be confusing. B2Y - Bandai to Yamato B2Y classic - the original ones that people have been purchasing that goes on the hinged part of the stand. Allows more pose-ability but won't hold heavier valks B2Y unhinged - comes in three varieties: level, Starboard (banking) and Port (banking) I've also bundled them up in different sorts for price breaks. Rock posted a topic in The Workshop! Cheated on my current project with 1/72 devil over the past holiday. Tired of waiting for Hase to bring it, so I'm working with Bandai's offering. Fixed Fighter. Gluing up the parting lines for the sub-assemblies and then removing the huge gaps is a pain. With some gluing and clamps, most appear to disappear after a few round of straight un-thinned surfacer dabbed on. Most of the work will consist of getting things to fit properly and removing the toy and transformation looking aspects (such as the joints all the fins connect with) for a more model-like appearance. A bit had to see but, I cut the tip off and glued some scrap pla-plate in its place, lengthening the nose and eventually upturning it a bit more like the DX Renewal figure has. I think adding some length should help with the short and stubby look. There does not seem to be a thread for all things L-Gaim so this can be it. http://en.wikipedia.org/wiki/Heavy_Metal_L-Gaim I've watched the subbed series up to about half way. At first I did not think I would like it, but it was the often ZANY interaction between Kyao, Amu and Leccee that made me keep watching. Also the maniacal Gavlet character is lol funny. The series does seem ancient, but the Robot Spirits line seems to be doing quite well and is up to its 8th release in the line. With the Heavy Metal G-Roon about to come out. The Bandai SPEC L-Gaim Mark I is a far superior piece, but I guess that line was too expensive to try to keep alive - so we got the 'much-cheaper-to-make' RS instead. Here are some pics of the Robot Spirits Calvary Temple Hellmeene . . .